Welcome to William Raveis Stowe Real Estate! Today we begin the first of many blog posts that are intended to help folks looking for new homes in Stowe (and beyond) with the regional knowledge they need to be equipped to find their dream home. We are excited to get the chance to be able to share with our prospective clients some tips of the trade regarding the luxury home buying experience, in addition to highlighting the many virtues of living in Stowe, Lamoille County, Vermont, and indeed, New England as a whole! In today’s inaugural post, we’d like to take the opportunity to inform those interested in the merits our Stowe realty company has to offer. We will share a bit of our history, our mission, and how we can help folks looking for houses for sale in Stowe, Vermont. So whether you are simply researching beautiful Stowe real estate for its own sake, or you are looking for a Vermont real estate agent worth their salt, you’ve come to the right place! Keep reading to learn more about what we at William Raveis Stowe Real Estate can do for you. Each client we serve has unique needs and expectations. We work diligently to provide top-quality real estate services to our clients, irrespective of whether they are buying or selling, and, naturally, irrespective of their desired price range. This is a contributing factor as to why we are Stowe’s leading real estate, marketing sales, and rental company. Our ability to meet the needs of our clients in a robust way sets us apart in our region. Our wealth of experience and familiarity with the regions which we serve, in concert with our access to cutting-edge technology and world-class marketing makes us worth consideration for anyone looking to buy a luxury home in Stowe or beyond. Customized marketing campaigns, listing presentations, website development, e-blasts and social media. A leading website at Raveis.com with more than 10 million unique visitors and 1 billion hits annually; 130+ offices and 4,000+ sales associates throughout VT, NH, ME, MA, CT, RI, NY, NJ and FL. National and global exposure through Leading Real Estate Companies of the World®, LuxuryPortfolio.com and other affiliations. A top-quality rental department, Stowe Realty Rentals, which features a range of Stowe condos and houses for vacation, short-term, or long-term visits to this beautiful part of the country. Our dedicated realty rental agents can assist you to help you find the kind of rental property you have in mind. For over 30 years, we have been owned and operated by folks who reflect the traditional New England values of a Vermont community — with dignity, peace, tradition, and pride being among them. When you select our Stowe real estate agency, you aren’t just receiving a predetermined package of services; you are receiving a partner who is invested in helping you achieve a positive outcome. Whether that is a short-term holiday rental or buying the lakeside luxury home of your dreams, we’ll work diligently to help you get there. 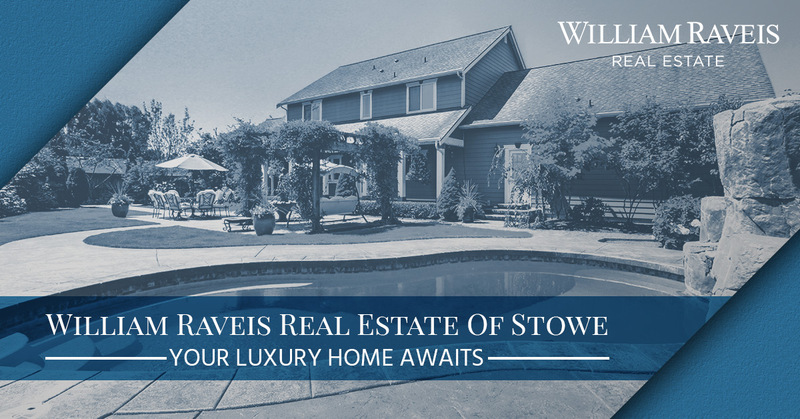 Partner with us at William Raveis Stowe Real Estate Company in order to take the first step toward finding the condo, property, or new Stowe home of your dreams! Oh! And we’ll leave you with perhaps the most glorious fact of all — we are the Official Realtor® of the Boston Red Sox. As if that weren’t reason enough to partner with us, we’ll also very good at what we do. Contact a dedicated realtor, or view Stowe listings today!